Fiji National University (FNU) is becoming the fastest growing university in the Pacific Region. Fiji National University being the state university was established in 2010 by merging seven institutions throughout Fiji including the Fiji School of Medicine, Fiji School of Nursing, Fiji Institute of Technology, Fiji College of Advanced Education, Lautoka Teachers College, Fiji College of Agriculture and the Training & Productivity Authority of Fiji (TPAF). These colleges have proven history dating back to the 1800’s and are continuing to enhance the teaching and learning programmes to keep up with the market requirements. The merger saw the birth of Fiji National University’s five colleges – College of Medicine, Nursing & Health Sciences (CMNHS), College of Business, Hospitality & Tourism Studies (CBHTS), College of Engineering, Science & Technology (CEST), College of Agriculture, Fisheries & Forestry (CAFF), College of Humanities & Education (CHE) and the National Training & Productivity Centre (NTPC). 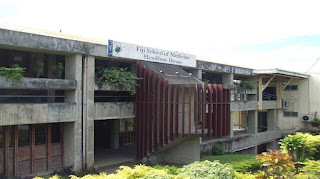 Fiji National University offers education and training at the post-secondary levels, including technical and vocational education and training, consistent with international standards of teaching, research, and other academic activities in institutions designed as institutions of higher learning. FNU now has campuses and centres at 40 locations throughout Fiji offering more than 300 study programmes to choose from, making the Fiji National University a one stop shop for prospective students. As a new and dynamic institution, yet, one with an illustrious history within its component parts, Fiji National University is continuously developing, innovating and expanding to provide Fiji and the region with the education and training that they most need. With an increasing intake of regional and international students, Fiji National University is continually signing new agreements with neighbouring island countries to upgrade and uplift its programmes, facilities and resources to suit the need of the employment market. Fiji National University not only makes quality tertiary education more reachable to the people of Fiji but also more accessible and affordable for students of all Pacific Island nations. All FNU programmes are competitively priced and students also have the opportunity to reside on campus with affordable accommodation rates. FNU provides a more hands-on and practical learning rather than theoretical teaching hence the Fiji National University produces industry ready graduates with appropriate and adequate experience to self-start at any organisation.